Freakspeakers: At the end he is just a LOOOOSER! At the end he is just a LOOOOSER! I can't help it, I'm really glad he ended in third place. He is just a disgusting misogynist. Donald Trump’s much-publicized tiff with “View” co-host Rosie O’Donnell failed to pump ratings for the sixth-season premiere of “The Apprentice” last night. The show nearly equaled last spring’s series-low bow among adults 18-49, and it sank to its worst-ever premiere among households, according to Media Life records. “Apprentice” averaged a 4.1 rating among adults 18-49, according to Nielsen overnights, 0.1 better than last year’s season five premiere. It drew a 5.7 among households, down half a point, or 8 percent, from last year. The 90-minute premiere, which began at 9:30 p.m., built in every half hour in 18-49s but did lose 20 percent of its lead-in, the new show “Grease: You’re the One That I Want,” sinking from the latter’s 4.5 at 9 p.m. to a 3.6 at 9:30 p.m. But even against the last half of a weaker-than-usual episode of ABC’s hit show “Desperate Housewives” last night, “Apprentice” showed little of its old spark. It finished behind ABC’s “Brothers & Sisters” in 18-49s at 10 p.m. and was third behind that and CBS’s “Without a Trace” in total viewers. The media-savvy Trump had tried to spur ratings with a recent PR blitz over his feud with O’Donnell, which began last month. Meanwhile, “Grease” had a solid debut, growing in each half hour. Fox was first for the night among 18-49s with a 7.0 average rating and a 16 share. ABC was second at 4.8/11, NBC third at 3.8/9, CBS fourth at 2.9/7, Univision fifth at 1.2/3 and CW sixth at 0.9/2. I'm hoping that eventhough Sam looks like Trump, he doesn't act like him....too funny! Thanks for the laugh. Can't tell you how happy I am that Apprentice didn't do so well in the ratings last night. Perhaps everything Trump touches will not turn to "gold". Only time will tell, it's still early in the season. What's been going on with Blogger tonight? Earlier I couldn't post comments or log in at all. I have never been so embarrassed for AC360 as I was today. Several colleagues and I watched 360 last night and they wanted to comment on Anderson's unnecessary need to ignore the big picture issues with his bud, Oprah. Anyways, a look at the blog produced more hysteria in the form of laughs at BettyAnn. Here's a latest lame contribution; but don't fret, there's another. She's so full of BS, lame juice is oozing from her pores. Thanks for the links to assist. I just got through clicking on them and making a donation. I appreciate the information informing us about this positive change and relief for the African people and giving us a chance to help also. At last there is some HOPE. These people have suffered in silence long enough. Thanks 360 bringing this to our attention and thus making a huge difference. Very COOL! It's hard to understand why the blog moderators HAVE to post ALL of Betty Ann and Lorie Ann's boring comments. I wonder if there's ever been a time when the Anns DIDN'T get posted. It sure doesn't seem like it. I sent a comment in yesterday and it posted. It seems like they are selective about who gets posted because there had to be a LOT of comments coming in at the same the time I posted mine, but there was a half-hour gap between when mine was posted and the next posted comment. I don't know what's up with that blog. 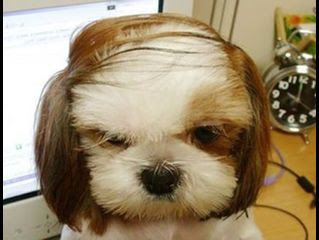 There is a letter that is floating around cyberspace that supposedly Trump wrote to O'Donnell about this hairflipping. I wish I knew for sure if he wrote it. There is also a report that O'Donnell had a meltdown (tantrum) yesterday and was yelling at Barbara Walters. I don't know about you all, but the last time I saw something like this was in high school! I am suprised that any guy would get involved in this kind of fighting. In this case, I still think Trump is the biggest drama queen! I agree with you about how all the Anns are posted. The other thing that irritates me is when one person can get two or more posts in the same blog entry! It makes me wonder if they really get that many blog posts. Surely if you get "hundreds" of posts each day you don't need to let the same person stand on the soapbox twice..and in the same entry! The only time the Ann's were not featured with a idiotic response was for the entry about the senate and football. No question there, they know nothing about sports and have nothing to contribute, not even their usual ubiquitous baloney. I have to think that the blog is getting little traffic, instead of the thousands claimed. I can't imagine why they would consistently post anyone's comments, and certainly not a train of useless jargon. @Anon 10:52: I totally agree with you. If the blog is getting "thousands" of entries, why do some posts get 100's of comments posted while others only 5 or 6. And you can pretty much bet those with only 5 or 6 comments will always have a Betty Ann or Lorie Ann entry!